The bridge on Capital Boulevard over Peace Street (Bridge No. 227) was built in 1948 and has a sufficiency rating of 42.9 out of a possible 100. 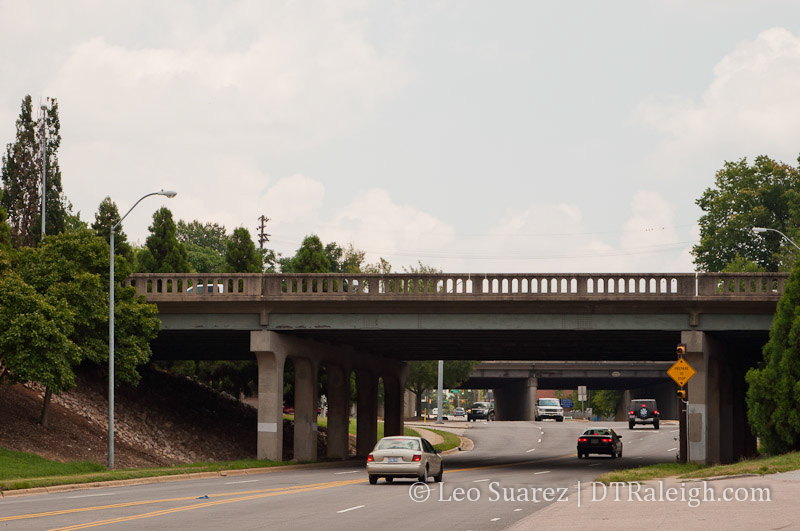 The bridge on Capital Boulevard at Wade Avenue was built in 1954, has a sufficiency rating of 34.1, and is posted with a weight limit. Both bridges are structurally deficient and functionally obsolete. While the existing bridges are still adequate to support traffic, they are nearing the end of their design lives and need to be replaced in a timely manner. I’d like to thank the NCDOT for wanting to upgrade our “structurally deficient and functionally obsolete” infrastructure. The project is in collaboration with the city’s Capital Blvd Corridor study which is still ongoing. This fall, expect a public workshop on the bridge replacement. I think NCDOT considers the I-440 bridge over Hillsborough, Beryl, and the railroad tracks to be in even worse shape than these two downtown. Yeah xyzzy, personally I’d like to see work start on the I-440 overpass before anything else, as that one looks to be at greatest risk of failure… Really, all of I-440 from the US 1/I-40 exchange to Wade Avenue desperately needs to be six- or even eight-laned as soon as possible. I don’t understand how it is that a highway that was built in the late ’50s-early ’60s hasn’t been changed a bit since then, while the entire region’s population and thus the amount of traffic has skyrocketed. While they are looking at those two it would make sense to upgrade the bridge that is an exit from Fairview Rd (off and on to Capital Blvd). It is in the same general location as the other two and looks as if it was built at the same time (also in terrible need or repair). However, I am afraid they are probably waiting for the fate of where the high speed rail will run before they up grade that bridge (since it would become unusable if the high speed goes down the west side of Capital). @Sarah – I could be remembering wrong, but I think one of the plans drawn up between the city, DOT and the Rail division showed the Fairview flyover being eliminated altogether. However another plan showed that Fairview would be tied into that service road and then bridged over Wade to meet with West Street. Meanwhile, Six Forks Road will be extended past Atlantic and tie into Hodge for a new intersection with Capital. The really weird part about the Peace Street intersection is how they will update the ramps to bring them to modern specs. I wonder if Finch’s is in the cross-hairs for that. I do know they expect to take some of the city land that has the garbage trucks parked on it near there. The TIP project for widening the beltline from Walnut to Wade is U-2719. http://www.ncdot.gov/projects/search/details.html#id=1914. It is scheduled to start construction in 2018. They hired PBS&J this January to do some preliminary design work. They will be widening it to 6 lanes, modernizing the highway (shoulders, ramp design) and certainly replacing all bridges. Interchanges will probably be rebuilt to some degree as well. The Western Boulevard interchange and the Hillsborough/Wade weave are definitely substandard. However, given the budget of $54 million I doubt there will be any major flyovers, although Wade Ave. East to 440 East could probably use one. An interesting somewhat related note is that the city of Raleigh owns a strip of land along the ITB side of 440 from Lake Johnson to Western Boulevard, that is planned to eventually be used for a greenway. The widening of 440 is the perfect chance to make that happen. Extra points from me if they can extend it another 3/4 mile further, past Western and Hillsborough, connecting it with the existing greenway next to the beltline at Meredith College. I say get rid of the bridge over Peace Street and return the intersection to a more urban form intersection. This will integrate the adjacent DT neighborhoods that are now divided, slow the traffic on Capital and allow the underdeveloped areas near it to be improved in an urban model as the city intends. Speeding the cars out of FT Raleigh now on this bridge disasociates this vital section of DT from the rest. And, by the looks of what does and doesn’t get developed on this stretch of road, it’s obvious to me that the idea of the bridge has failed over time. I meant DT Raleigh, not FT Raleigh…. sorry!! !